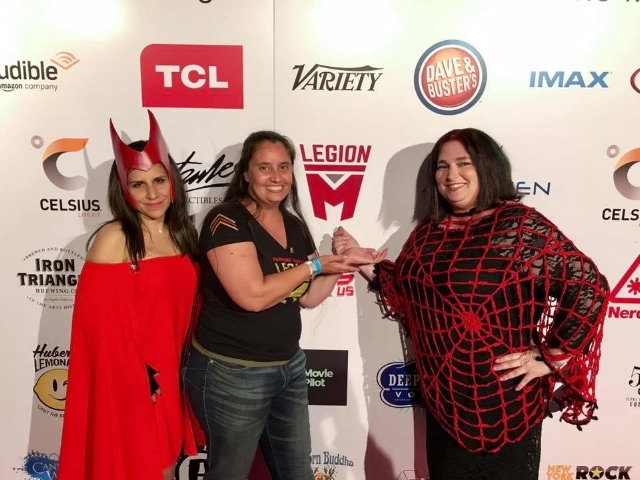 I never thought I would be honored with the privilege to attend Stan Lee's houseparty in the Hollywood Hills, but I've been blessed with some amazing opportunities since investing in Legion M.
My outfit for the evening was my personal tribute to Spiderman. I have never made a costume from scratch or cosplayed, so I knew I was going to have to purchase items to put my vision together. While still planning for the event, I found a handmade web in Cyprus that I could wear over a lace dress. Perfect! I also found a lady in the UK that handmade fandom heels, so I placed a special order. Got my hair done and I was ready! As I got dressed in the hotel I hoped that I would look all right considering there were going to be professional cosplayers there too. I can't even begin to describe this amazing night. I don't think I'll attend anything that will ever live up to it. You might have seen some photos of the event or videos of the views. Let me tell you, nothing is like seeing it in person. The views mesmerized me and wrapped around the event, hugging the party into the midnight hour. Joe, JonJon, and I arrived early while setup was still going on inside the house. Since it wasn't open yet for us to enter, we checked out the TCL Gaming Lounge in a separate room, accessible from the front. There were wall-mounted monitors all around the room with seats for each gaming station and a long, twisting couch for those of us that wanted to sit back and watch. Behind the couch was a table stocked with drinks. Out front, there was also a bar and tables set up. Large banners for event sponsors lined the front lawn, and the red carpet was nestled on the other side of the driveway. As soon as I heard word that the party was starting, I jumped in line for the red carpet. I couldn't find my friends, but didn't want to miss getting my photo by the professional photographers, so I went SOLO! 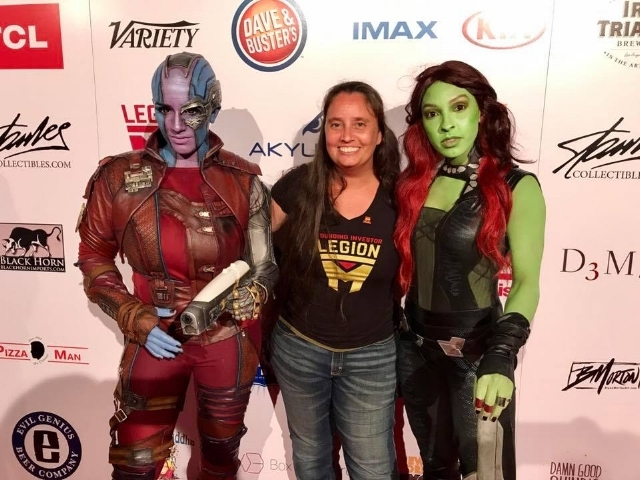 Later in the night, I was back on the red carpet multiple times with friends and cosplayers. I wanted to make sure I documented all the fun! When would I be able to do THIS again? When I walked into the house, it was already popping. Lots of party goers! The house was full of Marvel art on the walls, a full-size Iron Man, and collectibles displayed in cases. Looking all around, I smiled in disbelief at what I was walking into. A room off to the right of the entrance was another gaming room with lots of food. Farther down on the right, was a room filled with pizzas and geeky desserts made by Kneady Bakery. Get out of here with your Robert Brownie Jr.'s and Lord VoldeS'Mores! So geekilicious! In the kitchen sat Stan's superhero-layered birthday cake, made by Ivy DoomKitty herself! On the left side, as soon as you walked in the house, there was a staircase that went up to a VIP area with more items on display, more rooms to hang out in, and a huge bathroom that led out to another large balcony for guests to hang out on. I even saw some people posing for photos in the gigantic bathtub with Spiderman! I almost joined in myself, but alas my shyness kicked in. Back downstairs, there was another VIP lounge on the left, a full bar, and a room where you could take a photo with Groot, which I sadly didn't see! Luckily, I had seen him out front before the party started and Leesha and I grabbed a photo op. I wandered through the crowd and towards the back, realizing when I got to the glass doors with the marvelous views that I was on the second floor. “How do I get downstairs?” I asked someone. They pointed me towards an outside staircase that was at the end of the large balcony. Outside was paradise. There was a grotto-style pool with benches around it, another bar next to the pool, and artist Rob Prior was in between the bar and staircase doing more live art. The grassy lawn led right to the edge of a big hill, where benches waited for you to take in glorious views. The stage at the far end of the grass was home to awesome music by the Flux Capacitors. People danced the night away to their music. The other side of the lawn had stands with exotic drinks and souvenirs, and a walkway that led back up to the front of the house. The atmosphere was nerd-tastic! Everyone was there for the same reasons: their love of Stan Lee, their love of comics, their love of Marvel, their love and support of Legion M and the many other sponsors there. No one was judgmental. My insecurities were erased and I was at ease the minute I arrived. This says a lot since I have suffered from anxiety and panic disorder just about my whole life. Most of the night, people came up to me to tell me they loved the web I was wearing -- even the professional cosplayers! At the time, I didn't realize the remarkable groups of people that surrounded me. I'm still finding out who was who and who was there, and getting blown away. I spent most of the evening with my best friends JonJon and Joe outside, and a lot of time with Leesha Davis, one of my newest friends thanks to the Legion. JonJon introduced me to his friends Daniel Logan (young Boba Fett), apl.de.ap and Taboo (Black Eyed Peas), and Dante Basco (Rufio from Hook)! The celebrities there blended in with everyone. I'm still amazed at how nice everyone was. I loved running into people from the Legion throughout the party. Terri L, Terri P, Paul, Jeff, Phil, Michelle, Matan, Shao, Anthony, Ramona, Guy, Fon Davis, Eddie Perez, Damian, Eric, David and the list goes on! I even saw Thunder Levin again! Sharknado (If you read my Colossal Red Carpet blog, I met him there)! Stan Lee's arrival was the height of the party. He first stopped on the red carpet for photos and interviews, and then more interviews in front of the house. He made his way through the house and was gracious enough to do some photo ops. Out on the balcony he was waving to everyone and taking it all in. I tried to follow the group down the stairs but got lost in the crowd. Stan made his way to the stage and everyone gathered around. Paul and Jeff Co-Founders of Legion M, and Geek Gatsby (Bernie Bregman) gave speeches, and then Stan addressed the crowd. He was delighted with the day's festivities. First his handprint ceremony and now this? He gave quite the speech and was very honored for everything that had been done for him. Everyone toasted to him with their glass of champagne, sang Happy Birthday, and then Stan was surprised with a video montage from various stars of the Marvel movies including Tom Hiddleston, Ian McKellen, Mark Hamill, Benedict Cumberbatch, Chris Hemsworth, Tom Holland, Robert Downey Jr., Ryan Reynolds, and more! At one point, later in the night, Leesha ran up to me, “There’s a photo booth somewhere!” She had found someone’s pictures on the ground. She found the booth around the corner from the pool and I’m so glad she did! Our group ran over and the silliness started! Some of my favorite photos from the night happened there. It was truly a momentous night. What a marvelous feeling of accomplishment for everyone in Legion M, especially all those that worked so hard to put the events on. At the end of the night, standing on a balcony in front of the kitchen with friends, Jeff, Terri P, Joe, JonJon, and Leesha, I stared out over the yard, music still tempting you to bust a move, colorful lights dancing across our faces, and I felt so rewarded for being a founding investor of this impressive company. Legion M had left a mark, a Stan Lee sized mark!